Panama City Beach has long been known as a popular spring break spot, but did you know this section of Florida’s coast is also an incredible fishing destination? From amberjacks to goliaths, tarpon to cobia, there are lots of impressive fish to be had. But there’s one fish that I had wanted to tangle with for years: the beautiful red snapper. 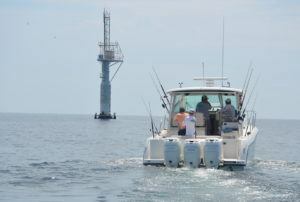 Recently, my camera crew and I met up with the guys from MarineMax Panama City and headed offshore in a Boston Whaler 345 Conquest, planning to fish a few wrecks, reefs and towers. Now, even though I personally own two Whalers — a 240 Dauntless and a 330 Outrage — and I get the chance to fish several different models each year while filming my TV series, this was my first time on the largest Conquest. Known for its strong performance and sophisticated styling, this award-winning model is definitely a contender in my books as a serious offshore fishing boat. There’s not a prettier bottom fish than the scarlet-colored red snapper. These fish are a deep rosy-red color, with a dark fringe around the dorsal and tail fins. Adults average 4 to 5 pounds but can reach over 50 pounds and are one of the Gulf of Mexico’s signature fish. 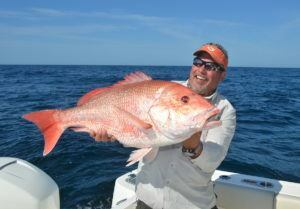 No matter their size, red snapper are amazing fighters, particularly on light tackle. Head shakes, twists and turns… just plain hard-nosed good fighters. Gulf red snapper have rebounded over the last few years due to bag and size limits, but they have yet to reach their strength in numbers of yesteryear due to the tremendous fishing pressure commercially. While they may be found inshore as young fish, adult red snapper are located primarily near structure in deeper water. They feed on crab, squid, shrimp and small fish, which they find near artificial reefs, oil rigs and other underwater structures. These reds are just one of over 100 described snapper species. They are predominantly a schooling fish, though the bigger fish don’t mind roaming alone. One thing is for sure: These snapper are extremely popular among recreational fishermen and a prized offering at restaurants and seafood markets. Big snapper act differently than small snapper. They’re not as quick, but they are wise, which is how they got big in the first place. The best tip is to use chum to get them fired up. Sometimes you can bring snapper to the surface by throwing out fish pieces or hanging a chum bag overboard. Since snapper act a lot like sharks, this technique really works, trust me. Snapper will hit anything from a bonito strip to squid to white bait, as well as shrimp, but live baits work best for the larger snapper. I prefer live cigar minnows. Another tip: Don’t be in a hurry to send your bait straight to the bottom; many times the bigger snapper suspend themselves on top of the smaller ones. A sharp hook and a long fluorocarbon leader between 40 and 50 lbs on light tackle will do the trick. But if you are going for the big boys, you’re going to have to beef up on everything; red snapper can be tough in and over structure. Pump that rod and crank as fast as you can to get them off the bottom and you will have success. Just make sure your camera has a lot of digital space to capture these gorgeous-colored fish! I have traveled the world and yet there are very few places like the offshore waters of Panama City Beach that produce such a variety of fish — and among those, one of my very favorites has to be the amazing red snapper. Note: The red snapper regulations change from year to year in both federal and state waters, so check with your local tackle store to make sure you are in the know.